The next four countertop ovens reviewed here are less expensive than the premium ovens but very capable. Each of them has convection cooking modes and special features. These lower priced countertops range in price from low-$200 to $300. One of the most innovative countertop manufacturers is Breville of Australia. 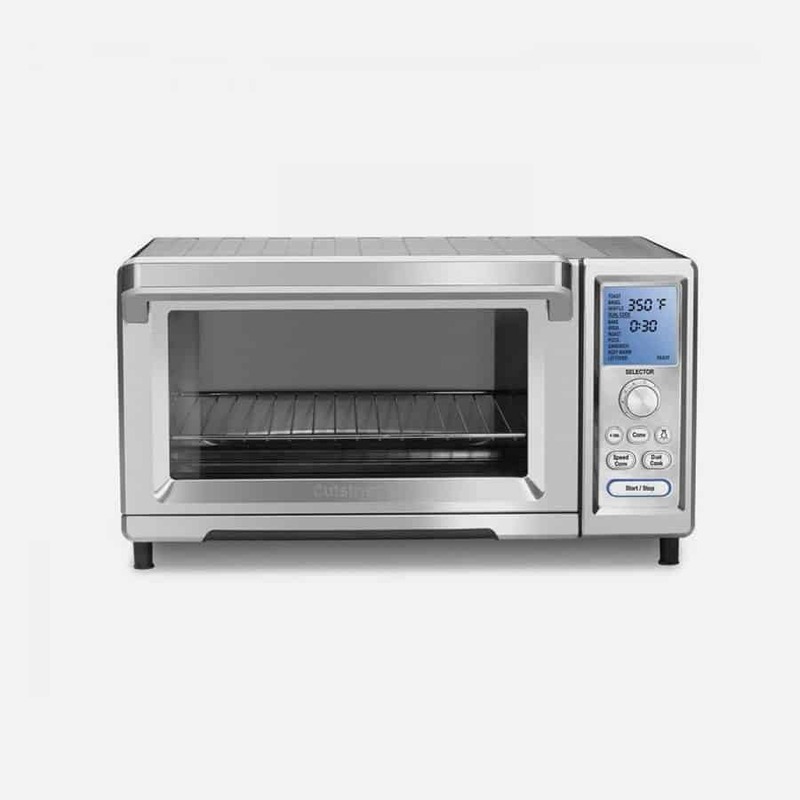 Breville has repeatedly introduced quality countertop ovens and toaster ovens for many years. One of their newest standouts, reviewed here, is the Breville BOV845BSS. (To see it now on Amazon click here). This quality oven has a lot of the same elements as the premium ovens do. It is 1,800 watts (like the Wolf Gourmet Countertop), stainless steel, tops out at 500 degrees Fahrenheit and has its own proprietary Element IQ™ smart technology system for setting modes, temperatures and times. This oven also has an auto-eject feature that pulls out the middle rack when you open the oven and even has an oven light. It is also smaller than the premium ovens. The interior measures about 0.80 cubic feet if you measure just the oven “box”, but more like 0.45 cubic feet when you deduct for the oven racks and heating elements. The Breville BOV845BSS has ten cooking modes, including specialty cooking modes like Pizza, Bagel, Cookies, Toast, Slow Cook and Reheat. Bake, Broil, Roast and Warm are also included. Each mode uses the Element IQ™ system to optimize the five cooking elements in the oven for each mode. For instance, Pizza mode uses each element at full blast to make a crispy pizza. Slow Cook uses just a few of the elements at a low heat setting for slow cooking. There is also a separate Frozen Foods button that adjusts cooking time and temperatures for frozen foods, so you don’t have to worry about making your own cooking time calculations. Note that this button can only be used with the Toast, Bagel, Pizza and Cookies functions. Each oven mode has default temperatures and cooking times that are easily changed to whatever time and temperatures you prefer. The temperature is displayed by default in Fahrenheit, but can be switched to Celsius. To change temperatures and times, all you have to do is rotate each of the two dials on the front of the oven, the temperature dial above or the time button below. The oven will remember the last times and temperatures that you used if you want to keep the same settings. At the end of every cooking cycle, the oven will alert you when your set cooking time is reached. Toast: This mode is designed for toasting bread, English muffins and even frozen waffles. This mode will crisp both sides of your bread or other food. Instead of temperature or time, this mode uses levels of darkness and number of slices to automatically set cooking temperature and time. The preset level of darkness is 4 and the preset number of slices is 4. These levels can be changed to whatever level of darkness you prefer up to 7 and up to 6 slices of toast! Once you make your settings and press Start, the cooking time will automatically be calculated. You can easily change the time or darkness levels after you’ve starting cooking, if you want, by turning the Temperature and Time dials to whatever you prefer. Bagel: This mode is designed to crisp one side of a bagel or other food more than the other. A bagel slice, or other bread, is placed in the oven and the side facing up will be toasted while the bottom side will just be warmed. If you want your bagel or other food to be crisp on both sides, use the Toast function. This mode uses levels of darkness instead of temperature and the Temperature dial is used to set the range that you want from “Light” to “Dark”. The default setting is 4. This mode also allows you to set the number of “Slices” of bagel halves or whatever you are cooking with the Time dial. The range of slices is from 1 to 6 and the default number is 4. Once your darkness and slices are set, the oven will automatically set the cooking time when you press Start. You can adjust the cooking time, the darkness level or the number of slices, if you want to, after the cooking has started. Bake: This function is used for all forms of baking and automatically defaults to 325 degrees Fahrenheit and 30 minutes cooking time. The Convection mode is also preset with this mode, if you don’t want to bake with the convection fan, just turn it off. Cooking times can be set for up to 10 hours as long as temperatures are set below 300 degrees and up to 2 hours above 300 degrees. Maximum temperature is 450 degrees. This mode will preheat and alert you when the temperature that you set is reached before the cooking time starts. Roast: Roast is designed for cooking foods that are dense, like cuts of meat or chicken. The preset temperature is 350 degrees and 1 hour of cooking time, it also defaults to include Convection cooking. Turn it off if you don’t want to use the convection fan. This mode may also be set to cook for up to 10 hours for temperatures below 300 degrees and 2 hours above 300 degrees, with a maximum possible temperature of 450 degrees. Preheating will also occur in this mode before cooking time starts, and an alert will sound when the target temperature is reached. Broil: This mode is used to put a sear on a cut of meat or add a crisp to a crust or anything else that needs searing. The preset temperature is 500 degrees and 10 minutes cooking time. In this mode, there are only three possible temperature settings, 500, 400 or 300 degrees. Cooking times can be set for up to 20 minutes. What Are Breville Smart Oven Pro’s Specialty Modes? Pizza: This mode, specially designed to cook pizza, also allows for the size of the pizza that you are cooking up to 13 inches in diameter (the minimum is 6 inches). The size is selected with the Time dial, the cooking time will be automatically be set once you choose temperature and size. The preset temperature is 450 degrees and the oven also defaults to Convection cooking mode and Frozen pizza. You can turn both of these off if you want to. Once preheating is done, an alert will sound and cooking time will start. If you are using a pizza stone, allow it to heat up first before putting the pizza in the oven. Cookies: This mode is designed to for cooking cookies, biscuits, cinnamon rolls and similar food. The default setting is 350 degrees and 11 minutes cooking time, with Convection cooking mode switched on. Maximum temperature in this mode is 450 degrees and 1 hour of cooking time. An alert will also sound when preheating is done. Reheat: This mode is designed to heat food that you might have in your refrigerator. The default mode is 325 degrees, 15 minutes cooking time and uses Convection mode. After the oven preheats, it will alert you when the target temperature is reached and cooking time will start. Temperatures can be set for up to 450 degrees in this mode and up to two hours cooking time. Warm: This mode keeps your cooked food warm, with a preset temperature of 160 degrees and 1 hour of warming time. You may adjust the temperature up to 450 degrees and set a cook time for up to 2 hours. Slow Cook: This mode is great for cooking “low and slow” that are featured in many recipes. There are two slow cooking temperatures, “HI” and “LO”. The default setting is “HI”, with 4 hours cooking time and Convection cooking mode on. The “HI” temperature setting can be set from 2 to 8 hours of cooking time. The “LO” setting can be set for between 4 and 10 hours of cooking time. After the oven is preheated, it will alert you that it is ready. This mode will also switch to Warm, for up to 2 hours, when preset cooking time is reached. The new features included in the BOV845BSS compared with the BOV800XL previous model is the oven light (Wolf Gourmet doesn’t have one) and a slow cooking function that allows you to cook for up to ten hours. Otherwise, it is basically the same oven as the BOV800XL. The interior usable space, what you can actually fit inside, as noted above, is 0.45 cubic feet. It is 13.25 inches wide, 11.25 inches deep (it curves in the back a little bit more for a pizza pan) and 5.25 inches high. The optional bamboo cutting board is a nice feature that fits on top of the oven and a smart use of space. Included with the Breville oven is a 12 inch baking pan, measuring 12” by 12”, a broil pan that inserts into the baking pan, a wire rack, a crumb tray and a 13” pizza pan. The Breville Smart Oven Pro, So What Next? Customers like all of the cooking modes and other features, like long (up to 10 hours) Slow Cook time, that this oven provides. They really like the addition of an oven light in this model from the prior model. The negatives for many reviewers are the small internal space provided and the reliability. Most of the negative reviews cited malfunctions that occurred in months rather than years. Like almost all of the countertop ovens, the Breville ovens come with a one year warranty. Given the possible failure of this oven in the first or second year, you should definitely buy an extended warranty, details below. You should take a lot of comfort in the fact that this oven is a top seller and most people really, really like it for all that it offers for the price. Just protect yourself with an extended warranty when you buy it. For the latest pricing and any discounts, you can see it at Amazon here. Cuisinart is another solid countertop oven manufacturer. The TOB-260N1 Chef’s Convection Oven (see it here on Amazon) is one of Cuisinart’s latest models and replaces the TOB-260N Silver model. This stainless steel convection oven has a pretty large interior compared to the other countertops in this category. It has almost 1 cubic foot of interior space before deducting for oven racks and heating elements. The usable space if you deduct for those elements is about 0.67 cubic feet. 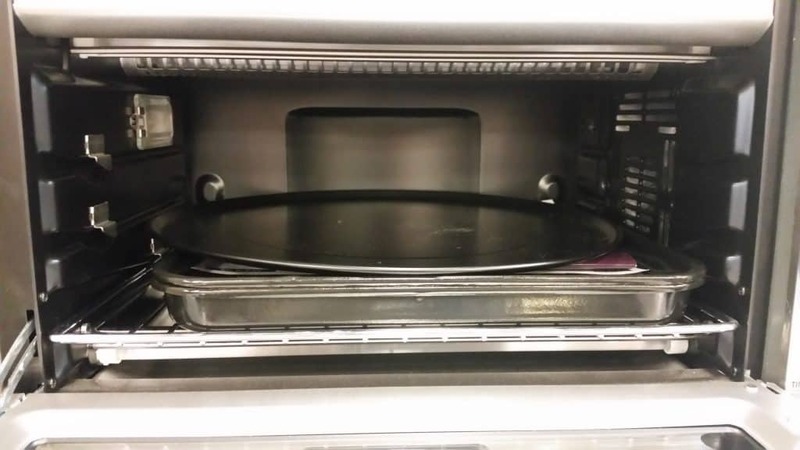 A 13 inch pizza or 9 slices of toast are designed to fit inside this oven. The exterior dimensions are 22.6 x 18.5 x 13 inches.The usable interior dimensions are about 14.5 inches wide, 13.25 inches deep and 6 inches high between the heating elements and lowest oven rack. It also weighs about 32 pounds. The 1800W of power in this oven can also hit some pretty high temperatures, up to 500 degrees Fahrenheit of heat, powered by five cooking elements. Also note that this oven has a light inside, if that’s important to you. The TOB-260N1 has 15 cooking modes and a lot of different functions and cooking options, including a fast pre-heat cycle and two speeds of convection cooking. Speed convection cooking uses the convection fan to spin faster than the regular convection cooking mode and is great for quickly cooking frozen foods. The 15 cooking modes are: Bake, Broil, Roast, Toast, Bagel, Waffle, Keep Warm, Pizza, Leftovers, Sandwich, Dual Cook, +30s, Convection Cooking (2 Modes), and Defrost. These modes are preset with temperatures and times that may easily be adjusted as needed or desired. The default temperature settings are in Fahrenheit, but you may alternatively select Celsius settings. Bake: This mode is designed for all your baking and includes your choice of using Convection or Speed Convection as desired. Speed Convection requires no preheating, but Bake and Convection Bake will preheat to your set temperature, and alert you when it’s reached. The default temperature is 350 degrees, but you may choose between 150 degrees and 450 degrees. The default cooking time is 30 minutes and can also be easily changed. Broil: Designed for searing, this mode has a fixed temperature of 500 degrees. Broil will add a nice crisp to a steak or to a casserole. You may also choose to use Convection or Speed Convection with this mode. The default cooking time is 10 minutes. Roast: This mode is designed for cooking thicker cuts of meat or other dense food. You may also use Convection or Speed Convection with this mode, Speed Convection will significantly reduce cooking times compared with conventional roasting. Roast and Convection in this mode will preheat to whatever temperature you set and alert you when it is reached. Super Convection doesn’t require preheating. The default temperature is 400 degrees and the default time is 30 minutes. Pizza: With this mode, you can use the pizza stone included with the oven to add an authentic crisp to the crust. The pizza stone needs to be heated first during preheating and will alert you when the temperature that you select is reached. The default temperature is 450 degrees. If your pizza is frozen, select the “snowflake”, or frozen option. This will extend cooking time to allow for defrosting in addition to cooking. The default cooking time is 15 minutes. You may also use Convection and Speed Convection with this mode. Sandwich: This mode is designed to crisp the bottom of your sandwich bread but use less power on the top elements to melt cheese, for example, on an open-faced sandwich. The preset temperature for this mode is 400 degrees with a preset time of 15 minutes. This mode can also be used with Convection and Super Convection. You may choose a range of temperatures from 150 degrees to 450 degrees. Keep Warm: This mode will keep your food warm after it’s cooked. The preset temperature is 175 degrees. The default time is 30 minutes, but you can can also choose a longer period. You can also choose a temperature between 150 degrees to 300 degrees. The timer will count down, alert you when it reaches zero and shut itself off. This mode can also be used with Speed Convection or Convection. Leftover: Use this mode to heat refrigerator leftovers, for example. The default temperature is 325 degrees and the default time is 20 minutes. You can set the temperature in this mode anywhere from 150 degrees to 450 degrees. Speed Convection and Convection can be used in this mode too. Toast: In this mode, you choose the shade of toasting you want, from light to dark, instead of temperature, the range is from 1 to 7. You can also choose anywhere between 1 and 9 slices of toast. The cooking time will adjust to your settings, the default setting is shade level 4 and 3-4 slices. You may also select the “snowflake” or frozen symbol, if your bread is frozen, to extend cooking time. Bagel: This mode is similar to Toast in settings, but uses half the cooking power on the bottom oven elements to toast the top of bagels or anything else you want to toast on top, while lightly toasting the bottom. You can also select the “snowflake” frozen symbol if your food is frozen, so that cooking time will be extended. Shading levels may also be selected between 1 and 7, and the default setting is 4. The default number of slices is 3-4, and you may choose between 1 and 9 slices. Waffle: Like Toast and Bagel modes, Waffle mode allows you to select shades between 1 and 7 with a default level of 4. This mode also defaults to the frozen, “snowflake” mode to extend cooking time for frozen waffles, you can “de-select” the frozen function if your waffles aren’t frozen. You may also choose up to 6 “slices” or waffles, the default is 3-4. Convection: This mode uses a fan inside the oven to move oven air evenly around the oven. This speeds cooking time and promotes evenly cooked food. Just press the “Conv” button to activate the fan, you can turn it off at any time. Convection is used with all of the cooking modes, Bake, Broil, Roast, Pizza, Sandwich, Leftover, Keep Warm and Leftover. Speed Convection: If Convection is fast, this mode is even faster. Speed Convection also eliminates the need for preheating. By using the convection fan at a higher speed, food is cooked even faster than standard Convection. This mode is selected by pressing the “Speed Conv” button. This mode is great for quickly defrosting and for using with the Roast mode. Speed Convection also works with Bake, Broil, Roast, Pizza, Sandwich, Leftover, Keep Warm and Leftover. Dual Cook: This mode lets you combine two cooking functions for a recipe that requires you to cook in two different ways. For example, you can choose to Bake for a certain time and then Broil for another. Or, as another example, you may choose to Bake at 350 degrees for 45 minutes and 250 degrees for 1 hour. Defrost: This mode extends cooking times to defrost frozen food and is selected by choosing the “snowflake” symbol on the control panel. +30: This mode extends cooking time for 30 seconds by pressing the “+30s” button. You may just want to keep cooking beyond the time that you’ve set and this mode gives you an easy way to do that. There are four rack positions and, with Dual Cook mode, you can cook different food simultaneously on two racks. The TOB-260N1 comes with 2 wire racks, a broiling pan, a baking/drip pan and even a pizza stone, a pretty good set of accessories. All of the components are also BPA free. Conclusion About The Cuisinart Chef? Reviewers often compare this oven to the Breville, some like this better and some don’t. What they really like are all of the accessories that come with this oven, even a pizza stone, that other ovens don’t provide and the oven light in this oven. Different reviewers also liked the different cooking modes and because there are so many, there are many favorites among them. Quality of construction and durability was an issue for some of the reviewers, those whose ovens failed. The ovens in this price range are all at risk of failing, even in the first one or two years. The good thing about this Cuisinart though, is that it has a 3-year warranty instead of the 1-year warranty that all the other ovens in this price range have. You can buy an extended warranty that will cover you for one year more, 4 years total, if you’d prefer. The extended warranty may be worthwhile for another year of protection and for convenience, but you don’t absolutely need one like you do when buying ovens with one year warranties. Take a look at current prices and any discounts for this Cuisinart Countertop oven in the Amazon store here. The KitchenAid KCO275, is the latest Kitchen Aid convection countertop oven (you can see it on Amazon here). This 1800W oven gives you a choice of seven colors (front only) should you need to color match with your kitchen or other appliances, or even just want a little more color in your kitchen. KitchenAid’s internal CeramaShield Coating (on this model only) is also scratch resistant, non-stick and PTFE/PFOA free. This oven also has an integrated “cool-down” rack on the top of the oven. The rack is insulated and allows you to take your hot rack out of the oven with your food or cookware and let it cool in its own specially designed place. Another nice design feature, built in handles on the bottom sides of the oven allow you to easily move it to another place in your kitchen. The cooking modes are Bake, Broil , Asado Roast, Pizza, Toast, Cookie, Bagel, Keep Warm and Reheat. There is also a “Frozen” button on the control panel that, when pressed, in Pizza, Toast, Cookie, Bagel modes will add extra cooking times that vary according to whichever of these modes is selected. The “Convection” cooking button, also uses the convection cooking fan in all modes except “Toast” to generally cook about 25% faster than without the fan by circulating hot oven air around your food and oven. In Cookie mode, the EasyConvect system automatically adjusts cooking temperature downward if a specific time is set, since convection cooking is faster. The cooking modes feature preset cooking times as part of KitchenAid’s “Even-Heat” system. Even-Heat uses the oven’s heating elements, to turn them off or on for best results for the mode you choose. Pizza mode, for instance, automatically broils for 30 seconds at the end of the cooking cycle for crisping pizza. Each of these modes has a preset time and temperature (default is Fahrenheit, but you may also choose Celsius) that you can easily adjust. The oven will remember whatever settings you last used and will keep them until you make another change in the settings. Bake: All of your baking is done in this mode and you may choose to turn the convection cooking fan on or off. This mode uses two of the three heating elements on the top of the oven and the two below at a preset 350 degrees and 30 minutes of cooking time. You can also choose to use the Frozen button in this mode, if your food is frozen. This will extend the cooking time, depending on your selected temperature, for defrosting. Asado Roast: This mode uses two stages of cooking that are designed to first crisp, then thoroughly cook thicker cuts of meat or other food. This mode also uses two of the three top elements and the bottom two elements. The first stage uses the convection fan by default, but you can turn it off. The cooking temperature is set to 450 degrees and the time set to 10 minutes. The second stage defaults to 325 degrees, but you may choose between 150 and 450 degrees. The default cooking time in the second stage is 45 minutes. Broil: This uses the top three heating elements to sear meat or crisp bread, and has two temperatures to choose from, 450 degrees or 350 degrees. The default setting is 450 degrees and 8 minutes, you can choose longer times but watch your food to make sure it doesn’t burn! You may also choose to use the convection cooking fan with this mode. Keep Warm: This mode is designed to keep your food warm after cooking, so your food should already be at its ideal temperature when this mode is used. It uses two of the three top elements and the bottom two elements for warming. The default temperature is 170 degrees but you may choose between 150 and 200 degrees. The default time is 60 minutes. Reheat: This mode is designed to work with two of the three top heating elements, the two bottom elements and the convection fan to heat food that may be stored in your refrigerator. The default temperature is 300 degrees, but you may choose anywhere from 150 to 450 degrees. The preset time is 15 minutes. Cookie: Designed for baking cookies or similar foods, this mode uses two of the three top elements and the bottom two elements with or without convection. If convection is used, then the temperature is automatically reduced by 25 degrees in this mode, since convection cooking is faster. The default temperature in this mode is 375 degrees, but you may choose between 150 degrees and 450 degrees. The default cooking time is 10 minutes. This mode also works with the Frozen button, if your cookies or other food is frozen. The cooking time will be extended whenever the Frozen button is pressed, to first defrost, then cook frozen cookies or other food. The extra cooking time will be automatically determined based on the temperature you’ve chosen. Pizza: This mode is designed to cook pizza with a crispy exterior. It starts cooking by using the two outer top heating elements and the bottom two heating elements then switches to Broil mode in the last 30 seconds of cooking time to crisp the top of the pizza. Pizza mode uses convection cooking by default and also uses the Frozen mode by default. The Frozen button, when activated, extends cooking time to allow for the extra time required to cook frozen food. If your pizza (or anything else you are cooking) isn’t frozen, just press the Frozen button to deactivate this mode. The default cooking temperature is 400 degrees, you can choose anywhere between 150 degrees and 450 degrees. The default cooking time is 17 minutes. Toast: This mode is designed to use the outer top two elements and the bottom two elements to toast bread, pastries or frozen waffles. For frozen items, activate the Frozen button to extend cooking time. You can select the level of shade that you prefer, from light to dark, on your toast or other food from level 1 to level 8. The default is level 4. You can also select the number of slices you want to cook, from 1 to 6 with a default number of 2. Bagel: This mode is designed to use two of the three top heating elements and the two bottom heating elements to toast the top side of a bagel slice. You can also use it for anything else you want to toast on one side, while only lightly toasting the bottom. This mode also works with the Frozen button to extend cooking time if your bagels or other food is frozen. You may also choose between 1 and 8 levels of shade, from light to dark, for your bagel or other food. The default level is 4. The number of bagel or other slices that you may choose is from 1 to 6 and the default number is 2. The KitchenAid KCO275 is among the smallest countertop ovens reviewed here. The internal measure is about 0.43 cubic feet when you deduct the space taken up by oven racks and heating elements. The internal measurements are about 12.5 inches wide, about 6 inches high and about 12 inches deep. The exterior dimensions are 18 inches wide, 12.1 inches high and 16.1 inches deep. Included with the oven are one 12″ non-stick multipurpose pan, a 12″ broiling rack, a cooling rack, and a non-stick drip tray. A removable crumb tray is also included that slides out for easy disposal of food crumbs or residue. There are three rack positions for different cooking techniques and foods and it weighs almost 20 pounds. The oven settings can alternatively be set for Fahrenheit or Celsius temperatures. The temperature maxes out at 450 degrees Fahrenheit, minimum is 150 degrees and note that this oven does not have an interior light. So If You Want To Buy The KitchenAid Countertop? Consider the user reviews. A lot of reviewers commented that they really like the color options and that this oven reached temperature pretty quickly. The negative reviews noted that the the colors for this oven only have colors on the front of the oven, not the rest of it. Also, oven failures. Like a lot of the ovens in this price range, the most negative reviews come from those whose ovens completely quit on them in the first or second year of ownership. The KitchenAid warranty is only 1-year, like most of the ovens reviewed here. So, to protect yourself against possible failures, buy an extended warranty (see below for options). To see the latest pricing for this oven and for any discounts in the Amazon store, click the links below, one for each color. Pick your color: Stainless Steel; Aqua Sky; Majestic Yellow; White; Cobalt Blue; Onyx Black; and Gloss Cinnamon. One of the newest countertop ovens is the DeLonghi America EO241250M Livenza Digital (see it on Amazon here). DeLonghi is an Italian appliance manufacturer that introduced this oven into the US market in 2016. This 1800W stainless steel oven includes an oven light. The oven temperatures maxes out at 450 degrees Fahrenheit. The oven heating elements are located in the top and bottom of the oven, but also surround the convection fan on the right side of the oven. A heating element surrounding the convection fan defines “true convection”, which this oven has and many others reviewed here do not. The heat from the heating element is directly circulated by the convection fan into the oven to better spread the hot oven air around the oven. 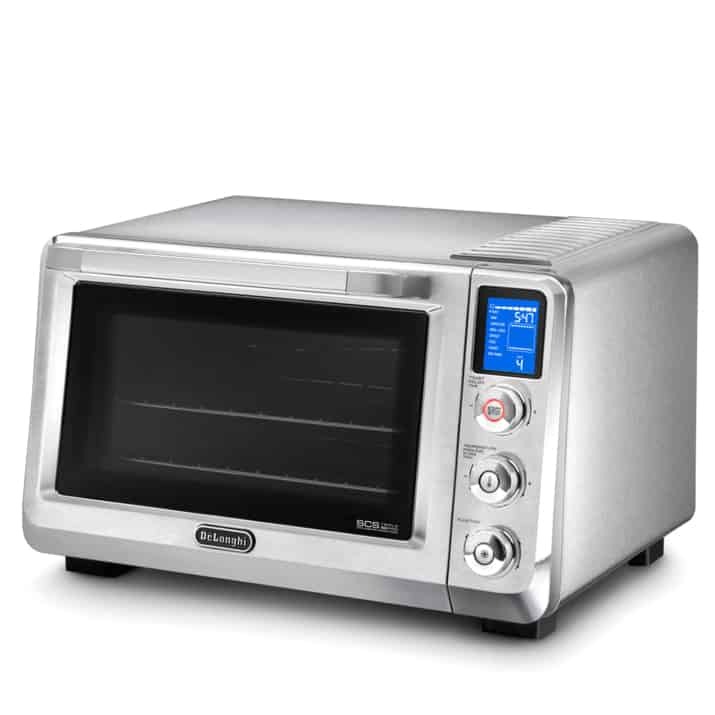 The EO24150M has multiple cooking modes, there are: Bake, Convection Bake, Broil/Grill, Defrost, Pizza, Cookies and Toast. Default temperatures vary for each of these modes and are expressed by default in Fahrenheit. You may alternatively choose Celsius settings. Toast: This mode allows you to set the level of toast color or level of “doneness” by rotating the oven’s Toast Color/Time dial. You can choose the number of slices to toast from 2 to 6 by rotating the temperature dial. Press the start button and the oven will start cooking for as long as necessary to match the toast color you’ve chosen and the number of slices. The oven will alert you when time is up. Bake: For all of your baking, choose this mode, the default temperature is 350 degrees. The range of temperatures available in this mode is 170 degrees to 450 degrees, just rotate the temperature dial to set temperature. For setting the cooking time, rotate the time dial. The default time for this setting is 1 hour and you can set it for up to 2 hours. Once your settings are made, start the oven and preheating begins. When the temperature that you’ve set is reached, you will be alerted by a beeping sound and the same sound will alert you then the cooking time you’ve set is up. Convection: This mode uses the oven fan to better circulate hot oven air around the oven, producing more evenly cooked food faster than without convection. Convection cooking time generally reduces cooking time by about 25%. The range of temperatures that you may choose in this mode is 170 degrees to 450 degrees with a default temperature of 350 degrees. Just rotate the temperature dial to your desired temperature. For changing the cooking time, rotate the time dial to set up to 2 hours of convection cooking time. The default cooking time is 1 hour. Once you start this mode, preheating begins just like in Bake mode and “beeps” to alert you when the temperature is reached. When the cooking time is up, you will also be alerted with a “beep”. Broil/Grill: This mode doesn’t use heating, but uses the top heating elements in the oven at high temperature to put a sear on meat, fish or vegetables and a crisp on things that can be “crisped”. The temperature is automatically set by the oven, but you may choose cooking times up to 2 hours. Defrost: This mode automatically sets the oven temperature based on the time you choose to defrost your frozen food. You may choose to defrost up to 2 hours, then just start the Defrost mode. The oven will also alert you when the time you set is reached. Pizza: This mode is designed to cook either frozen or fresh pizza. The mode automatically defaults to frozen, but you can turn it off by pressing the “snowflake” frozen button. In this mode, select the size of the pizza with the temperature dial, from 6 inch wide pizzas to 13 inches. Then use the time dial to select the level of “crispness” that you prefer. Once these settings are made, start the oven and the cooking time will be automatically calculated. When you are not using the frozen, or “snowflake” option, that is, when you are cooking fresh pizza, the oven will alert you when it’s time to add your cheese topping for optimal melting. When time is up, the alert also sounds. You can also add extra time at the end of the cycle if you want your pizza cooked longer. This oven is also designed to cook two pizzas at the same time by using the maximum crispness setting. Cookies: This mode is designed to cook up to two trays of cookies, one on top of the other, by rotating the temperature dial for either one or two racks of cookies. Temperature in Cookies mode is automatically selected by the oven. The time is also automatically determined by the oven, but you can change the time if you’d prefer. You can also add extra cooking time at the end of the cooking cycle. Keep Warm: In addition to keeping food warm at a low temperature, the great thing about this mode is that you can use it as a slow cooker since it stays on for up to 6 hours. The DeLonghi oven has about 0.85 cubic feet of internal space before deducting for the racks and the heating elements. When you do that, the internal usable space is about 0.67 cubic feet, still among the largest ovens reviewed in this category. The usable dimensions are about 13 inches wide, 12 inches deep and 7.5 inches high. The external measurements are 19 inches wide, 17.5 inches deep and 12 inches high. Included with the oven are a bake pan, a pizza pan, 2 wire racks and a crumb tray. The oven has four rack positions for flexible rack placement, higher or lower depending on what you are cooking and whether you are cooking with two racks. Recommendations For The DeLonghi Countertop Oven? The user reviews are positive. The pizza function seems to work pretty smoothly and most like the interior size of this oven. Like all of the ovens in this price range except Cuisinart, this oven comes with a 1-year warranty. Since it’s been recently introduced into the market durability is still unknown, but we still would recommend buying an extended warranty. The ovens in this price range might not last as long as you might expect them to, so better to protect yourself and look at the extended warranty options below. Check the latest pricing and any discounts in the Amazon store here. So What Is The Best Moderately Priced Countertop Convection Oven? 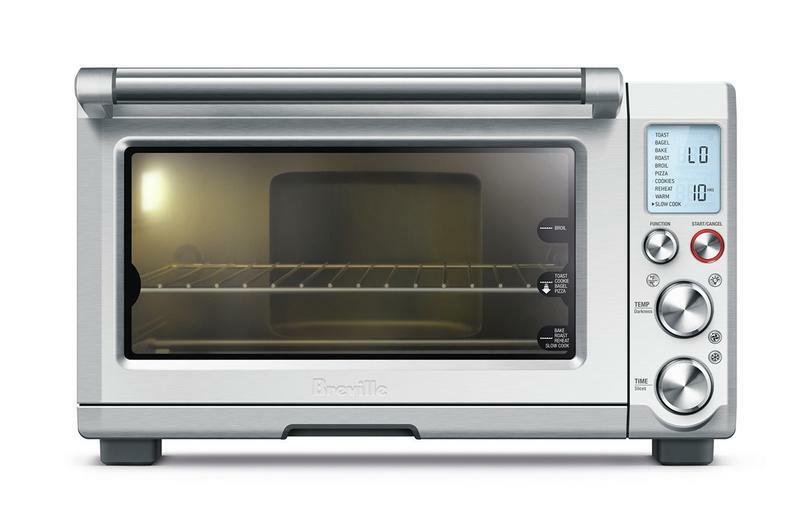 The best of these lower priced high quality countertop ovens is Breville’s Smart Oven Pro BOV845BSS. Our decision is based on our own objective analysis of the features, design and price of the Smart Oven Pro. We also look at the overwhelming 5-star customer reviews of this countertop. Compared to others in the $200 to $300 price category, Breville offers the best quality and functions for the price. Each of the ovens reviewed in this category has something going for them. For instance, the Cuisinart TOB260 has even more cooking modes than Breville’s and a 3-year warranty. The KitchenAid has different colors and nice design features. The DeLonghi has a fairly large interior and a robust pizza function. Breville though, is an expert manufacturer of countertop ovens. These ovens are among the best selling because people love how well they work and the functions they provide for the price. For latest pricing and any discounts, see it again in the Amazon store with extended warranty coverage (recommended) here.